Lower East designed the new website for Danish textile artist Lise Frølund. We had a very fruitful coorporation with Lise. She wished for a simple, aestetic and elegant website with good space for presenting her projects in text and pictures and a website that was easy to use. This is what we designed for her. We are proud and happy about the result. Thanks to Ricoland, programmer and web specialist, who did a great job. Have a look into Lises artistic univers. She is a great weaver and a cool lady. She creates huge beautiful wall carpets and experiments with sound and light as well. Her work has been shown on many exhibitions in Denmark and abroad and she has received several grants and prizes for her work. 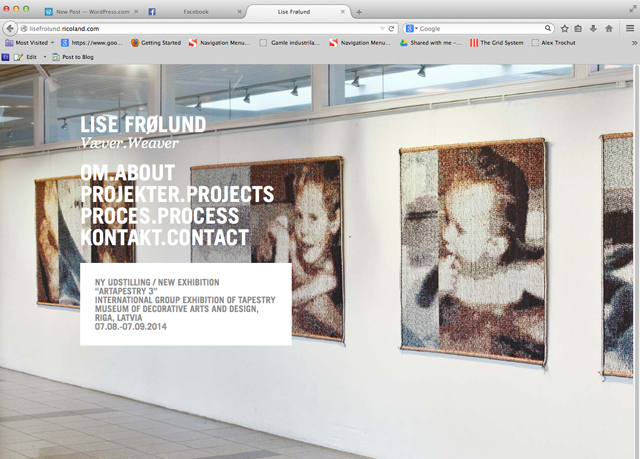 See and read much more on Lise Frølunds website. Or have a sneek peak in her lookbook. Congratulations Lise with your new website.